The 3D effects were decent. The plot had to many holes, but the negatives outweighed the positives to make this movie fun and perfect first date. Excellent movie fun! The 3D was cool and the gore was fantastic. It was super cheesy, and not very scary, but it scores points with me for being 3D, that was so cool! I'm surprised no one is complaining of having cross eyed vision after a full Hour and a half plus flik. The last time I saw Nightmare on Elm Street with the last few minute scene in 3d my eyes took a while to adjust. Unless they greatly improved the quality of 3d since then, all you people just paid to get eye damage. HA HA HA!!!!!!! 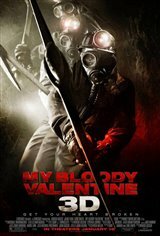 My Bloody Valentine 3D Is Awsome!!!!!!!!!! A Must See!!!!!!!!! $14.50 Is Worth It!!!!!!!!!!!!!!!!! !